This is the 3rd album of longtime Buddy Guy sideman Scott Hold who formed his own band in 1992 to kill time when Buddy Guy is off. The 35 year old guitarist and singer started playing guitar age 20 and was mainly influenced by Jimi Hendrix, Stevie Ray Vaughn and Buddy Guy. In 1999 Holt left Buddy Guy's band after 10 years to concentrate on his band. His debut Messing With The Kid was released in 1998 and in 1999 Dark Of The Night which features Buddy Guy. 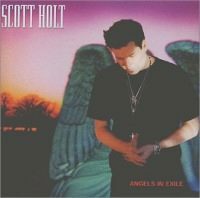 On Angels In Exile Scott Holt present a dozen blues rock songs like I'll Make Love To You Anytime, Baby Let's Go or the title track Angels In Exile. Another gem is the powerful ballad Up In Flames. Not necessary to mention that Holt chose great musicians for his band, but beside his band he got joined by Paul Barrere and Billy Payne on the tracks Spanish Moon and Blind Willie McTell. Responsible for the production were Greg Hampton and Arnie Goodman. Great album which is interesting not just for fans of blues rock! Many young rock fans might know Ritchie Sambora, but Scott Holt is way better! So, check this album out! And if you don't find the album at your record store, you can order it from www.bluestormmusic.com!